The El Dorado School Board voted unanimously Tuesday night to hire Steven Jones as the new head football coach for El Dorado Schools. Jones is finishing up his 9th year as a high school football coach. 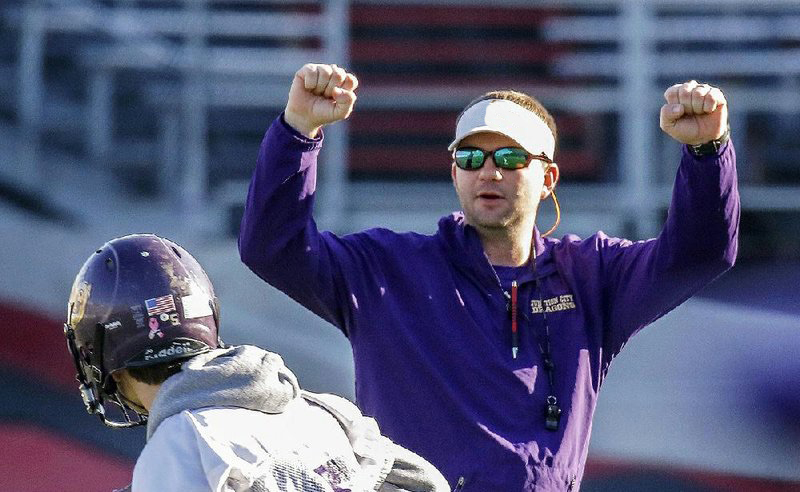 In the past two years as Head Coach at Junction City, his alma mater, the Dragons went 25-3 and won the Class AA State Championship in 2018. The Dragons were a perfect 15-0 at home during this two year stretch. Junction City finished Jones’ first season as Class AAA Runner-Up and led their classification in total offense both seasons. The 2017 team racked up over 6000 yards of total offense and 88 touchdowns. Jones was named 2018 Class AA Coach of the Year by both Hooten’s Arkansas Football and the Little Rock Touchdown Club. Jones came to Junction City after a two year stint as the Offensive Coordinator at Class 6A Searcy High School. Searcy’s offense led the team to their best win total at that time since 2011. Searcy made it to the state quarterfinals for the first time in 20 years before losing to eventual state champion Pine Bluff. Before being hired at Searcy, Jones spent his first 5 years as a coach in the DeWitt School District. After a successful two year run as the Head Baseball Coach at DeWitt, where the team made its first regional tournament appearance in 14 years, Jones was hired to lead the Class 4A team’s football program at 23 years old. In his final two years at DeWitt, Jones led the Dragons to their best two-year stretch in over 15 years. He graduated in 2010 with a Bachelor’s degree in Health and Physical Education from Louisiana College. Jones also received a Master’s degree in Physical Education and Coaching in December 2018 from the University of Arkansas at Monticello. The search for a new head coach began on December 20, after the resignation of Coach Scott Reed, who took a position as head coach at Cabot. El Dorado Schools put together a committee of Phillip Lansdell, Superintendent Jim Tucker and community member and former Wildcat football player Matthew Shepherd to meet with the top 10 candidates throughout Arkansas, Mississippi, and Louisiana who inquired about the position. The committee narrowed the list of 10 down to 3 top candidates and formed a panel to conduct interviews. The interview panel consisted of School Board member Wayne Gibson, Personnel Director Melissa Powell, community members Matthew Shepherd and Reggie Thomas, Athletic Director Phillip Lansdell and Superintendent Jim Tucker. After completion of the interviews, a unanimous decision was made to recommend to the El Dorado School Board Steven Jones, head football coach at Junction City High School to be the new head football coach at El Dorado High School. “We have conducted a very thorough search for our next head coach. We are excited and pleased to have Steven Jones on board as a Wildcat. We have confidence that he will continue the strong tradition of success in our football program," said Superintendent Jim Tucker.